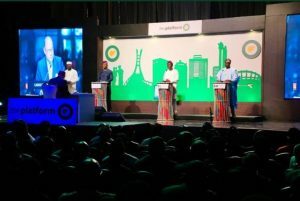 The candidate of the Action Democratic Party (ADP), Babatunde Gbadamosi, was the dark horse that wowed members of the audience in Saturday’s Lagos gubernatorial election debate, as he spoke confidently of his plans if elected governor of the country’s commercial capital. Mr Gbadamosi, who was a member of the Peoples Democratic Party (PDP) before defecting to the ADP, received rave reviews of his performance in the debate, which was organised by The Platform, a civic discussion initiative of the Covenant Christian Centre. The interview which was moderated by British-Nigerian Christian broadcaster, Victor Oladokun, had in attendance alongside Mr Gbadamosi, the candidate of the ruling All Progressives Congress (APC), Babajide Sanwo-Olu, the PDP candidate, Jimi Agbaje, and the candidate of the Alliance for Democracy (AD), Owolabi Salis. Mr Gbadamosi started off on a somewhat shaky note when he was asked about what he would do in his first hundred days in office if elected. He explained that he would try increasing the salaries of civil servants in the state, but he did not explain how he would raise the additional fund needed to do this. He, however, bounced back from the initial flutter, arguing that his priority will be to boost the infrastructural shortfall of the state by building rail lines to all the exit points of the state, opening up water transportation and the movement of container by barges instead of through the roads to cut the infamous Lagos traffic. The ADP candidate, who berated the ruling party in the state for lack of prudence in running the state finances, said he would bring his experience from the private sector in handling the spending of state funds. According to him, he would be able to do this because he “does not have a godfather”, which was a snide remark on the candidate of the ruling APC, Mr Sanwo-Olu, who enjoys the backing of a former governor of the state, Bola Tinubu, generally believed to be the de facto political leader of the state. Mr Gbadamosi also correctly fact-checked the APC candidate after he falsely stated that the state government was transparent and publishes its budgets. Mr Gbadamosi pointed out that the state budget website no longer existed stating that the government is known for being opaque rather than open. He said if elected into office he would operate an open government. He berated the current government for being unable to complete its light rail project in 10 years and wondered why the state was paying for it from its purse when it could have welcomed the private sector to finance the project. He also said at a cost of almost $1 billion, the light rail project was too expensive. He said he would open up the state waterways and improve tourism as a means of growing the state tax revenue if elected into office. In all, he was the most eloquent of the candidate on display. The figures and data he quoted were mostly correct. He also cited examples of what was being done in other places with similar demographics like Lagos such as Singapore and Ethiopia. Mr Sanwo-Olu, as the candidate of the ruling party, which has been in power for 20 years in the state, unsurprisingly was put on the defensive throughout the debate. But he did a fairly good job of shaking off the attacks from other candidates and in fact, on a couple of occasions, was on the offensive. He spoke about his experience as a banker and public officer. He said he would bring the experience garnered from being a three-time commissioner in the state in running the state effectively. He promised to tackle the traffic gridlock in the city and especially promised to solve the perennial gridlock in the Apapa area of the state. The APC candidate said he would be a listening governor and regularly hold town hall meetings across the state to discuss some of the pressing problems of the state.